Goldstone is a sad place. A frontier town in the middle of the desert, it's the kind of place you'd expect to have been erased from the map a long time ago. Everything about it is temporary: the homes, the offices, the motelâ€¦ trailers which have been dropped in place. Everything, that is, with the exception of the mine. 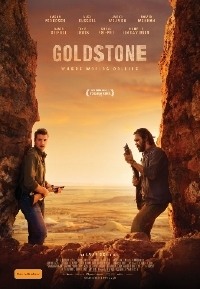 Goldstone continues on because the mining company has uncovered huge deposits of gold in the nearby indigenous land and the local mining bosses will do anything to keep the gold flowing. The setting alone is almost enough to set-up Ivan Sen's Goldstone as a movie to see but into the mix the writer/director throws is the story of Jay Swan, a city investigator on the trail of a missing woman thought to have last been seen in the town. Jay has problems but he's a good man and his trip to Goldstone turns out to be as much about solving the case of the missing woman as it is about finding himself, making the movie far more interesting that your average outback thriller. For starters, there's the political power play in motion between the mine administrators, the town politicians and the aboriginal leaders. Then there's the young town sheriff who means well but is inexperienced and perhaps letting things slide because he's friendly with the mostly white locals. Into all of this Sen mixes Jay with his own demons and his search for salvation and that personal struggle, brings with it an entirely new set of themes. Yet, what I love most about Goldstone are the eccentricities Sen boils into the story from the pie-baking-baby-adopting mayor with a hidden secret played brilliantly by Jacki Weaver to the shorts-wearing mine administrator played by David Wenham. There are endless layers of drama and politics, issues of race and religion, at interplay in Goldstone yet they are all necessary and authentic parts to the story being told. This isn't just a mystery but also a political statement about the state of minority communities â€“ be they in Australia or elsewhere. The stories and themes explored in Sen's film are universal; they also just happen to be weaved into a darn good thriller which culminates into a rather spectacular desert shootout. Goldstone is not only a great thriller, it's also a movie with an important message about community and the power and importance of making difficult choices. Most importantly, it does all of this without being preachy or garish. Sen continues to prove that he is not only an apt filmmaker but that he's capable of producing entertainment with message. A rare feat indeed. and then we look to what is happening with pipeline and the People who are protesting their land being destroyed by that pipeline in the Dakotas. This is actially a stand-alone sequel to 'Mystery Road' which featured the same aboriginal detective.